This is our 1080p digital video camera and 11.5 monitor. 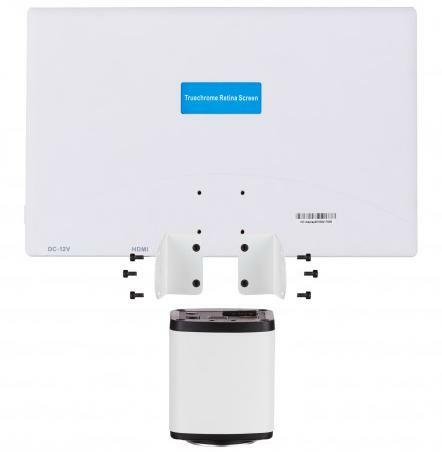 Everything you need to mount the camera and monitor is included, so you can conveniently view your microscope’s image without any external device necessary! 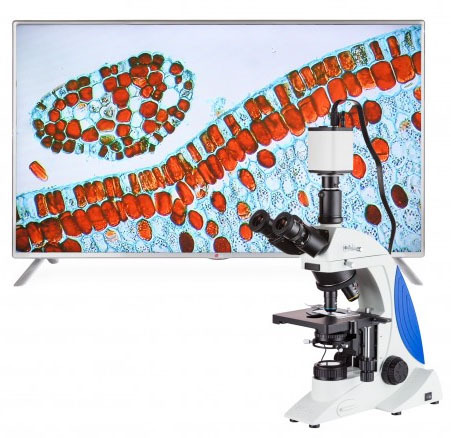 Our brand new 1920x1080, 15fps camera kit with 11.5 monitor allows for live viewing and recording of your microscope image with ease. Record to an SD card or computer via USB 2.0. 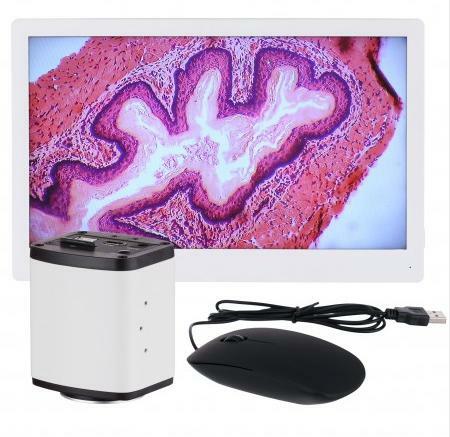 Now, viewing your microscope’s image digitally has never been easier; simply connect the camera to the monitor, or any HDMI display, and attach a USB mouse, and you’re up and running with crystal clear images. On-screen adjustments can be easily made for exposure, saturation, brightness, contrast, tint, and noise reduction to provide you with the best image possible for any application. 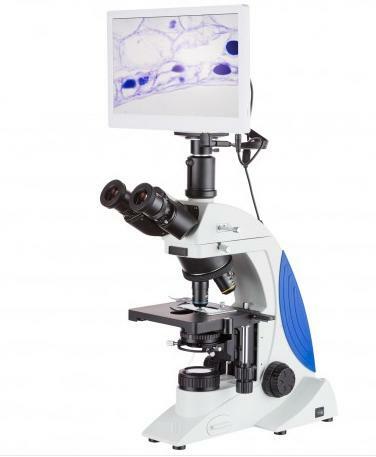 Compatible with stereo microscopes and compound microscopes, whether your needs are biological, industrial, gemological, or any other type of microscopy. HD1 uses a new 5 megapixel HD image sensor. The detail is more clearly presented, providing for excellent image quality. The significant innovation of HD1 is embedding the application software inside the camera. The user can control the camera with just a mouse. There is no need for a PC. HD1 automatically analyzes the acquired images and optimizes the white balance, exposure time and saturation, to present perfect images. 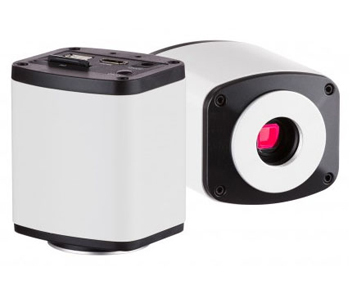 Whatever for bright field bio imaging or dark field birefringent crystal imaging, HD1 delivers ideal images, barely needing any parameter adjustment. HD1 embedded software is designed for ease of use. There are only two icons on the software starting screen, one for image capture and the other for the settings menu. It’s as intuitive as a smart phone. For the first time, an HDMI camera is equipped with complete exposure and gain settings. It allows to exposure settings from 1ms to up to 10 seconds and 20 levels of gain adjustment. Compared with 1st generation HD camera where only auto exposure was available, the ease of use has been significantly improved and moreover, the sensitivity is 300 times higher. An increase of the exposure time increases the image noise. But the integrated 3D noise reduction function keeps the HD1 image always clean and sharp. The following comparison images show the amazing 3D noise reduction effect. A series of image operation buttons on the right side of the screen allows the image to be flipped, rotated or a Region of Interest (ROI) to be selected. The ROI function can help to get more image details through magnification. The image comparison function is available in the setting menu. An image can be chosen to compare with the live image and even moved around or have a ROI selected. HD1 adopts innovative FPGA dual-core processor, FPGA1 high-definition image quality processor and FPGA2 image output controller, to ensure high speed high quality images.